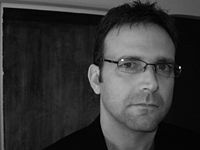 Stephen Cope is the editor of George Oppen: Selected Prose, Daybooks, and Papers (U. of California Press, 2007), and the author of numerous articles and reviews related to twentieth century American and Caribbean poetry and poetics. His chapbooks include Versiones Vertiges, and his poetry has appeared most recently in Denver Quarterly. He is completing a manuscript of poetry entitled "Bellerophonic Letters" and his current critical projects include a study of Modernist poetry and negativity. Stephen Cope was a founding contributor to Descriptions of an Imaginary University, a series of weekly anonymous and pseudonymed writings in poetry, poetics, and culture distributed widely in the mid-1990s via e-mail, the Internet, and listserv. He has taught numerous online literautre and writing courses, and, with the poetty/music/performance group 'thelemonade,' participated in numerosu experiments in digitally based on-line collaborative writing and performance as early as 1991. From 1999-2002 he served as a program host for World Music Radio, the first Internet only radio webcast devoted solely to international music. His interest in digital writing, podcasting, and webcasting is ongoing.